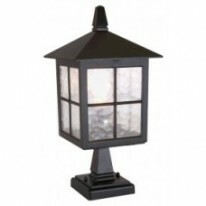 82504BKAlex Outdoor Post Lamp - 1 Light Black Ht10..
82508BKAlex Outdoor Post Lamp - 1 Light Black Ht18..
82540BKAlex Outdoor Post Lamp - 3 Light Black Ht 2..
82503BKAlex Outdoor Post Lamp - Small 1 Light Blac..
7174Bel Aire Outdoor Post Lamp 1 Light BlackThis ..
7173-3Bel Aire Outdoor Post Lamp 3 Light BlackThis..
6441-450BKBox Outdoor 1 Light Rectangle Head Post ..
6441-900BKBox Outdoor 1 Light Rectangle Head Post ..
1568Capri - 1 Light Outdoor Post (Height 95cm), Ru..
1569-3Capri - 3 Light Outdoor Post (Height 235cm),..
1574BRPompeii - 1 Light Outdoor Post (Height 212cm..
1264Stroud Bollard/post Lamp - Black AlluminiumA s..
EL-40047This fitting is an IP44 rated, rust proof,..
YG-3502A traditional die cast aluminium post lante..
YG-864-SSOutdoor bollard constructed from stainles..
We stock lamp posts for homeowners, business properties and public grounds. The range come with a variety of choice in size, as they range from as little as 400mm to 2250mm, cap amounts, you can grab yourself a post with a single light or a post with three lights and material, with the choice of plastic or rust free aluminum. The only thing we do keep constraint is the color! These can be connected to your mains supply and can come fitted with a indoor switch, an outdoor switch or/and a motion detector. Due to their size we don't stock these in stores, they are online only.